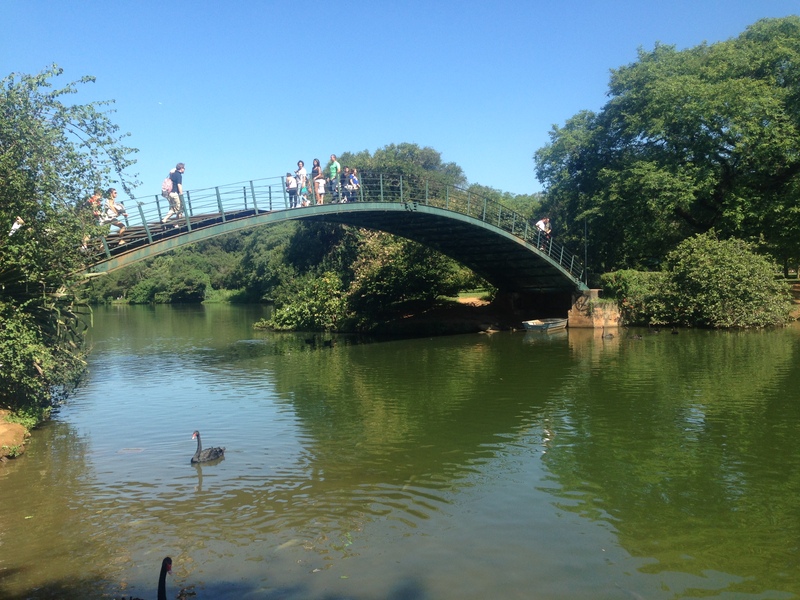 Ibirapuera Park should be the top of most must-see lists for visitors to São Paulo. Ibirapuera actually means “rotten tree” in the indigenous Tupi language, but, in spite of this unfortunate name, the park teems with arboreal life. At times, especially on Sunday afternoons, people actually outnumber the trees in this urban park. As evidence of this, Ibirapuera Park was found to be one of the most popular destinations for Facebook “check-ins” in the world in 2013. It is certainly a favorite place for people to walk, jog, rollerblade, skateboard or bike under the shade of trees, admire works of art in the numerous museums around the park, listen to music at one of the auditoriums or concert spaces, or just temporarily forget that they are in the middle of a massive concrete jungle, home to almost 20 million people. While there is no beach in the city of São Paulo, Ibirapuera could be considered São Paulo’s answer to Rio’s Ipanema Beach, complete with beautiful suntanned bodies and água de coco stands. 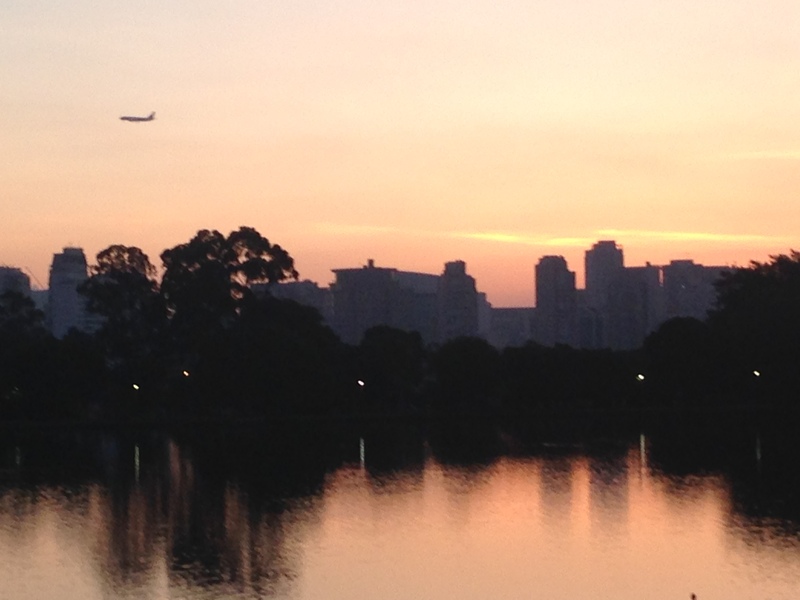 Ibirapuera is a beautiful, safe place to exercise, relax or appreciate arts and culture. 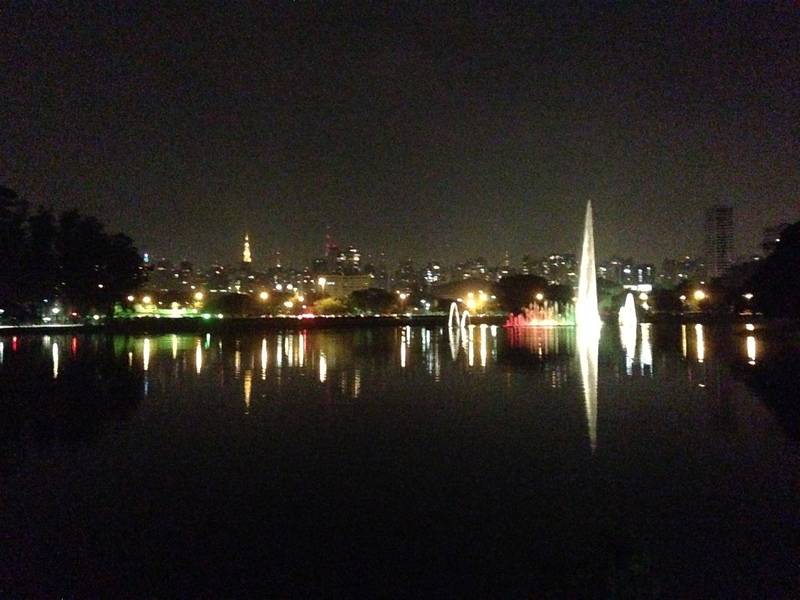 My first visit to Ibirapuera Park was actually at night. A friend of mine and I walked there from the nearby Jardins neighborhood. At first I was unsure whether it was really safe to visit the park after dark, especially in a city like São Paulo that has a such a horrible reputation for crime. I found the park to well-patrolled, full of people exercising and enjoying the night air. Our first stop was the Bandeirantes Statue, a monument to the “bandeirantes” of São Paulo, groups of people who, in the early years of Sao Paulo, ventured into the wilderness to find slaves and fortune. The monument was carved out of 240 blocks of granite and designed by Italian-Brazilian sculptor, Victor Brecheret. 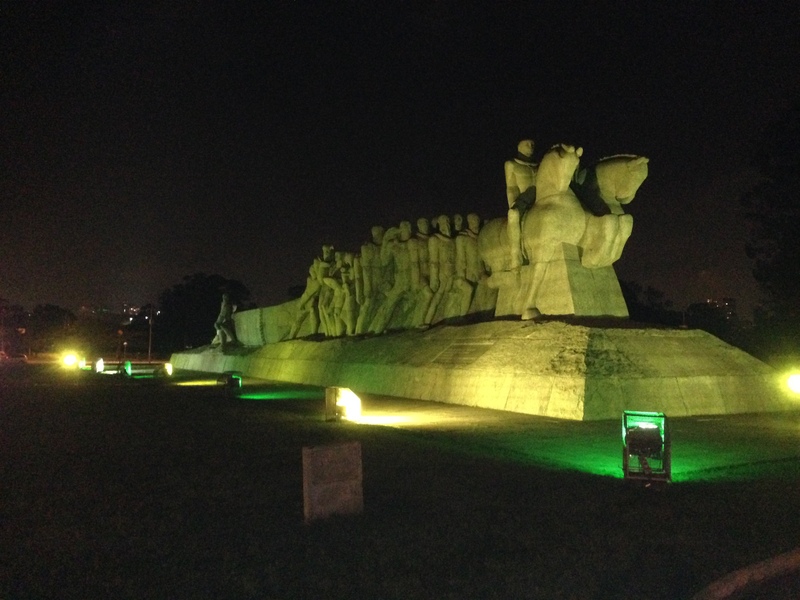 The statue is especially impressive at night. From there, we entered the park and walked around the 2000 meter loop track that circulates visitors around the park. At the northern edge of the park, dancing fountains adorn one of the ornamental lakes, illuminated with lights that change constantly change color. Off it the distance, you could also see the lights from the office buildings along Avenida Paulista. The park is heavily watched by the military police both day and night. The opening hours of the park actually stretch from 5 AM to midnight. On my many visits there, I have never felt unsafe. The plans for Ibirapuera Park had their beginnings in the 1920s, when the mayor of São Paulo, José Pires do Rio, envisioned turning the land on which the parks sits, a swamp at the time, into an urban park the likes of the Bois de Boulogne in Paris, Hyde Park in London or Central Park in New York City. In 1927, Manuel Lopes de Oliveira, a city official, drained the swamp and planted Australian eucalyptus trees on the land. The development of the park did not start up again until 1951, when governor Lucas Nogueira Garcez instituted a commission to build the park in commemoration of the 400th anniversary of São Paulo’s founding. Famed Brazilian architect Oscar Niemeyer designed several of the park’s buildings while Robert Burle Marx and Otávio Agusto de Teixeira Mendes provided the park’s landscape architecture. The park actually wasn’t ready in time for the month of city’s anniversary, but had its inauguration seven months later in August 1954. The opening celebrations involved pavilions by thirteen states of Brazil and nineteen countries. Some of the pavilion structures continue to be used today as museums or auditoriums. Bienal Pavilion/Ciccillo Matarazzo Pavilion – This boxy building, designed by Niemeyer and Hélio Uchôa, hosts a biannual art exposition, called the São Paulo Art Biennal (Bienal), founded in 1951 and held every two years, usually in October or November. The event was modeled after the Venice Biennale. The exposition has hosted works by Pablo Picasso and Jackson Pollack, among many other notable artists. The building houses the Museum of Contemporary Art, University of São Paulo. 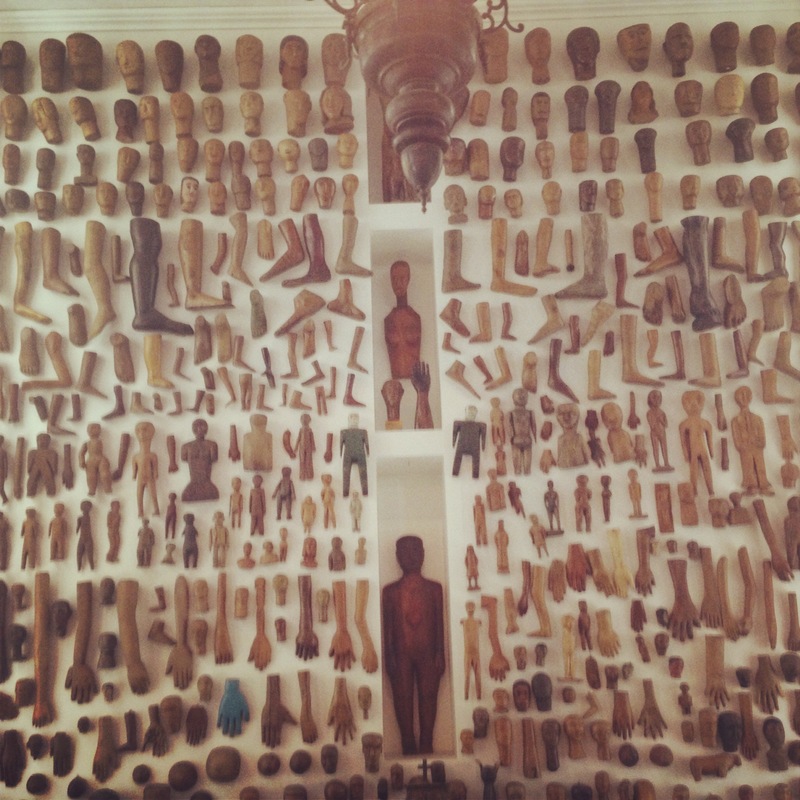 This free museum hosts an impressive collection of Afro-Brazilian art, especially in the form of wooden sculptures. A visit to this music gives the visitor a lots of information about Afro-Brazilian history and plentiful examples of Afro-Brazilian artwork. This is probably one of the more under-appreciated museums in São Paulo. This is another boxy, white Niemeyer-designed building that was the Pavilion of Nations during the inaugural exposition. It once housed municipal offices prior to becoming the site of the Museum of Afro-Brasil. Oca (Lucas Nogueira Garcez Pavilion) – This dome, also designed by Niemeyer, looks as if a spaceship has landed in the middle of the park. It houses the Museum of Aeronautics and the Museum of Folklore. São Paulo Museum of Modern Art – This museum was built underneath a winding concrete pavilion, designed by Niemeyer, called the Grand Marquise. The museum has had offers to move to another location, but has stayed in the same place. Niemeyer himself criticized this continued use, thinking it inappropriate. Outside the museum, skateboarders have effectively taken over the concrete slab underneath the pavilion. I doubt Niemeyer had intended this use either. Japanese Pavilion – One of the surviving “nations” pavilions from the opening celebration that you can visit today is the Japanese Pavilion, a replica of the Katsura Imperial Villa in Kyoto. Obelisk – This 72 meter high obelisk, designed by Italian-Brazilian sculptor Galileo Ugo Emendabili, an a monument to the Constitutional Revolution of 1932. Ibirapuera Auditorium – This futuristic building was completed in 2005 from the original Niemeyer plan. The building hosts concerts and awards ceremonies. Also notable are the Ibirapuera Gymnasium, a 11,000 seat area hosts concerts and sporting events, and the Ibirapuera Planetarium, another building shaped like a flying saucer. Unfortunately, the park isn’t located close to any of the city’s Metro stops. The closest ones are probably Ana Rosa or Vila Mariana. From either station, you can take a city bus to the park. If you want to avoid the crowds, try to avoid coming on weekends when the track gets so full, it can be hard for joggers to run through the sea of people. A great way to spend an evening close to Ibirapuera Park and continue the theme of futuristic, Jetsons-style architecture is to have drinks at the Sky Bar on top of the Hotel Unique. The hotel’s structure is a grey half-moon with circular windows resting between two pillars. The views from the top of the cityscape are dazzling. From there you can see the antennae from the buildings along Avenida Paulista and remind yourself that you are in one of the largest cities in the world. Ibirapuera Park is truly a world-class urban space, combining leisure and culture on artistically landscaped grounds and structures crafted by one of Brazil’s most famous architects. The park is certainly one of São Paulo’s greatest assets, adding to the quality of life of its citizens and providing a safe and relaxing place for visitors to enjoy. Have you visited Ibirapuera Park? What features did you enjoy about it the most?